Almost Down And Out, This Resurrected Resort Returns As A Bargain For Senior Skiers. 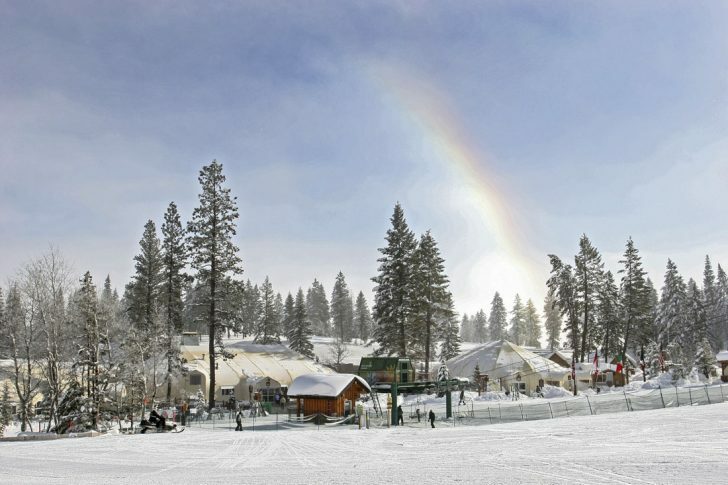 The base at Tamarack Resort with sports and cafe domes and a snow rainbow. Tamarack is the original comeback kid. It opened in 2004 to great fanfare and serious celebrity cred, the first new ski resort in the US since Beaver Creek in 1980. With tennis star Andre Agassi and wife Steffi Graf at their publicity helm, the idea was to focus on real estate. And for four years, this worked. 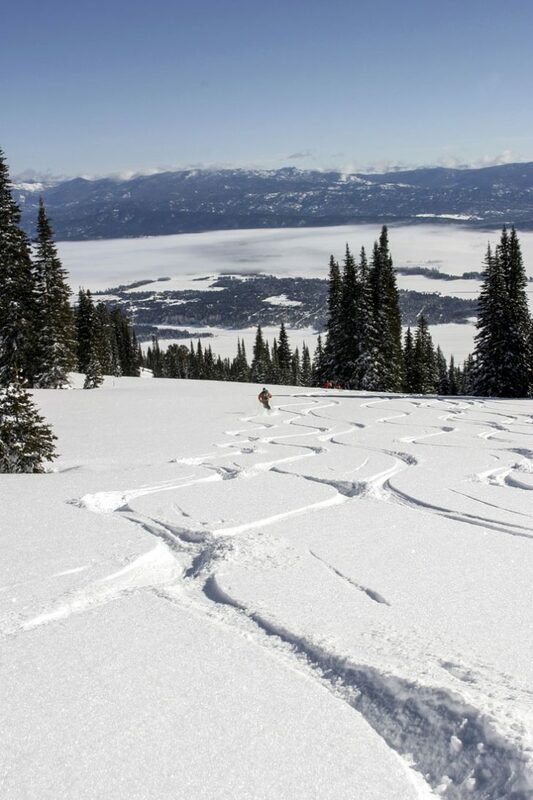 Skiing powder at Tamarack, Donnelly, ID., near McCall. Then came the recession; the resort was forced to close for a year and one ski lift was repossessed (a helicopter actually carried it away). It took years to sort out the financial problems, which finally, were laid to rest in 2014. And now, the homeowners have taken over, the lifts are running, the grooming could be mistaken for Deer Valley manicuring, and you can ski on a budget ($69 adult, $44 senior) while feeling like the place belongs to you and you alone. Today, the resort remains in a somewhat half finished state. The original village was never completed (you can see uncovered Tyvek on the side of the unfinished lodge), and the base lodge consists of “temporary” domes covering the sports shop and restaurants. And while powder hounds are not disappointed, what truly makes this place shine is cruising that will never, ever, put you to sleep. No straight down the fall line, yawn stuff, the cruisers here twist and turn, drop over unexpected humps, sift through widely spaced trees and, heck, are adrenaline fun. Location: Tamarack is in Tamarack, ID, close to Donnelly, ID, about 20 miles south of McCall, and 100 miles north of Boise, in west central Idaho. Terrain, lifts: 42 runs and 6 lifts, including 2 high-speed quads across 1,000 acres of lift- served terrain. 17 percent novice, 45 percent intermediate, 38 percent advanced terrain. Ski season is usually early December to early April. 25 percent of terrain is covered by snowmaking. Vertical: 2800 feet, top at 7,700 feet, base at 4,900 feet. Skiing powder at Tamarack Resort. Nordic and more: The Tamarack Nordic Trail system offers a variety of trails that wind through open meadows and forested paths. 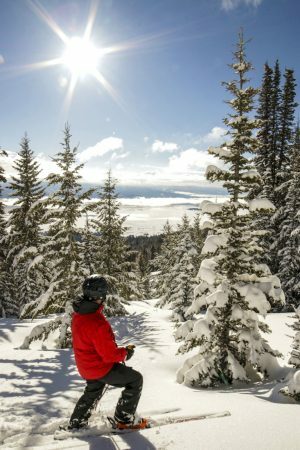 Choose your own adventure through the groves of Aspen, fir, pine and Tamarack trees on classic or skate skis, fat tire bike or snowshoes. Lot to lift access: One main parking lot about 100 feet from the Sports Dome that serves as Tamarack’s base lodge. On the rare occasion this fills, there’s a second lot near the unfinished village along the main entrance road. You can also easily walk to the lifts from this lot. Public transportation: None. You really need a rental car. Accomodations: Options at Tamarack Resort are numerous and reasonably priced. Hotel rooms during regular season this year were running $150 a night and a four bedroom chalet could be had for $309 (though fees and taxes are extra). These run from the Lodge at Osprey Meadows to cottages, chalets, town homes and estate homes, all located in the resort. For lodging, click here. The vibe: Do you want a resort with killer slopes, grooming and powder all to yourself? This IS the place. Sometimes, it’s a bit lonely out there. But, except on school ski days, you don’t have to worry if some out of control boarder is going to take out your shoulder blades. While the “temporary” domes give the place an incongruously rough and ready feel, the service, the food and, yes, the accommodations, are closer to Deer Valley than Bogus Basin. Dining: Five options for dining running the gamut from burgers and pizza at Canoe Grill to a nice selection at Seven Devil’s Pub at the resort base (don’t miss the stuffed chicken breast). Mountain life: As with other area ski resorts from Brundage in McCall to Bogus Basin in Boise, you don’t come here to lounge around a fireplace. It’s snow. More snow. Even more snow. You ski downhill. You ski nordic. You snowshoe. You fat tire bike. You don’t sit.